Political and communal worker; born in London May 14, 1852; died Jan. 31, 1901. He was educated at the St. Marylebone's and City of London schools. For nine years (1884-92) he filled the position of honorary secretary to the Jewish Board of Guardians of London. He was a member of several political associations and was active in organizing political campaigns in the metropolitan constituencies. 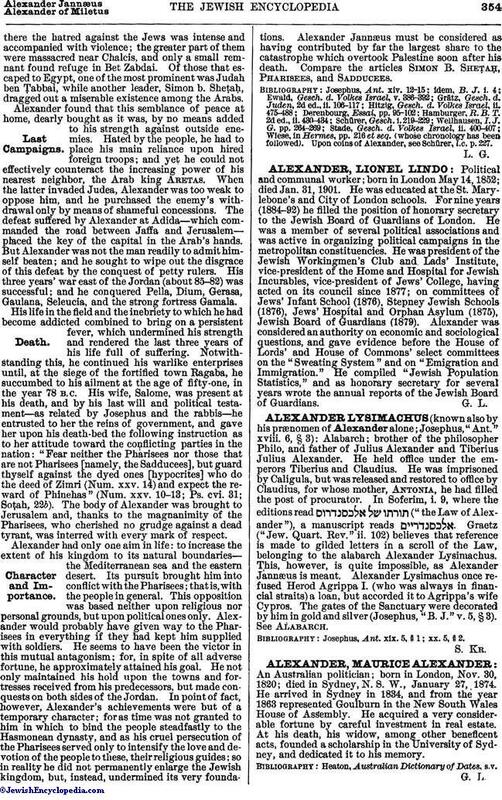 He was president of the Jewish Workingmen's Club and Lads' Institute, vice-president of the Home and Hospital for Jewish Incurables, vice-president of Jews' College, having acted on its council since 1877; on committees of Jews' Infant School (1876), Stepney Jewish Schools (1876), Jews' Hospital and Orphan Asylum (1875), Jewish Board of Guardians (1879). Alexander was considered an authority on economic and sociological questions, and gave evidence before the House of Lords' and House of Commons' select committees on the "Sweating System" and on "Emigration and Immigration." He compiled "Jewish Population Statistics," and as honorary secretary for several years wrote the annual reports of the Jewish Board of Guardians.